Fast forward 20 years and Britannia, arguably, does the same. 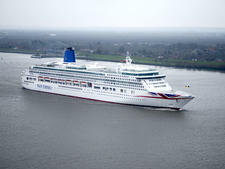 The ship is by far the biggest in P&O Cruises' fleet, carrying 3,647 passengers and weighing in at 141,000 tons -- 27,000 tons heavier and carrying 547 more passengers than the line's previous biggest ship, Azura. 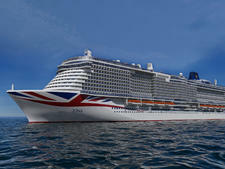 Britannia is also the biggest ship ever built specifically for the UK market. Though ultimately owned by a U.S. company (Carnival Corp.), and built in Italy, the ship is registered in Southampton (due to European tonnage tax laws), and has a very British feel to it. For the first time a British design company, Richmond International, has overseen the whole of the design of the ship's interiors rather than parts. Richmond International has worked on a number of great British hotels -- including The Langham, Mandarin Oriental Hyde Park, Intercontinental Hotel London and Four Seasons Hampshire -- and it shows in Britannia. The ship has the feel of a luxurious boutique hotel, with expensive-looking textures of wood, leather and glass in every public space and lavish use of marble. The ship is not showy (except perhaps in the atrium); it's all about understated luxury. The overriding colour scheme throughout is nautical blues and creams, soft greys and touches of gold and silver. Stand-out features include the stunning three-tier atrium complete with a star burst sculpture made from shards of aluminium and bathed in coloured light. The atrium is intended to be a destination -- rather than a place to pass through on your way somewhere else -- with Eric Lanlard's Market Cafe and Olly Smith's the Glass House both central features and the reception desk shifted to an adjacent corridor. 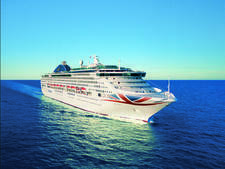 Britannia takes the most popular features of the rest of the fleet -- such as The Glass House, Sindhu restaurant and the Crow's Nest Bar -- and adds some brand new features such as the Cookery Club and a TV Studio. The aim is to incorporate P&O Cruise's 150-plus years of history, but use modern design touches and a non-traditional cruise ship look and feel to try and bring in new-to-cruise passengers. Celebrity chefs are an obvious draw, as are Britannia's Strictly Come Dancing link-up and intimate performances by stars in The Live Lounge. Families can take advantage of the biggest and best children's facilities of any P&O Cruises' ship. Another big emphasis is on food, and the line has enlisted the help of TV chef James Martin to create the first cookery school onboard a British ship, simply named the Cookery Club. He will be joined by the so-called "Food Heroes" -- P&O regulars Marco Pierre White, wine guru Olly Smith, acclaimed patissier Eric "Cake Boy" Lanlard and cheese expert Charlie Turnbull -- in leading cooking classes during the day and -- on selected sailings -- hosting intimate dinners with passengers in the evening. 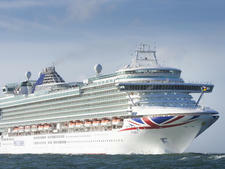 Britannia is also big on art, with a huge collection of more than 6,000 pieces. You can see these pieces everywhere -- in the cabins, the corridors and the restaurants -- and all are originals from British artists, commissioned by the line. 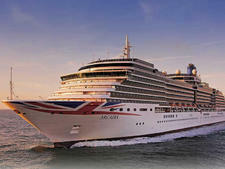 Overall, the ship is elegant and refined and perfectly captures the spirit of modern Britain. In school holidays expect a large number of families with young children, with the average age hovering around the early- to mid-40s. Outside of these times, and on longer cruises, the average age rises to a more traditional P&O crowd: over-60s and no kids. 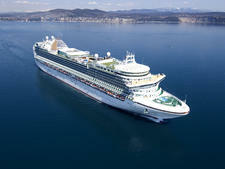 A typical two-week cruise will have four formal nights and the rest will be 'evening casual', which is defined as open necked shirt and 'tailored trousers' or smart jeans for men; dress or casual separates for women. Most passengers err on the side of smart. Note that even though this ship is family friendly and has a more relaxed vibe -- formal still means full black tie in the public rooms. 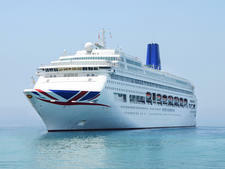 Britannia might break many of P&O Cruises' traditions, but dress code still rules -- and that also applies to older children. A £7 GBP per person auto gratuity is added to your bill daily (for over 12s). Other tips are at your discretion. The onboard currency is the British pound.